On arrival at the airport meet with our representative, and then transfer to the hotel. Overnight stay at hotel. After breakfast transfer to Delhi Airport for Leh. On arrival at Leh airport meet our executive and transfer to pre booked hotel / Guest house for relax and acclimatisation. This is necessary for getting acclimatised at high altitude. Evening one can visit the colorful market of Leh. Overnight in the hotel / Guest house. Thiksey Gompa, close to Shey is about 17 kms from Leh. 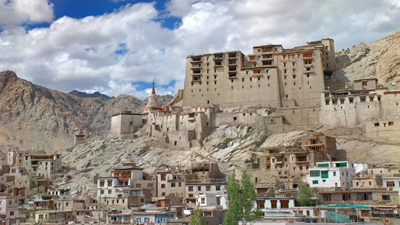 The monastery is considered to be one of the most beautiful in Ladakh and belongs to the Gelukpa order. Hemis, about 45 kms south of Leh it is one of the most famous and largest monastery in Ladakh. It belongs to the Drukpa order and was founded in the early 17’th century. The setting is perfect with the monastery cradled in a lovely valley, surrounded by streams and fronted by long Mani walls. Overnight stay at hotel. Early Morning drive to Pangong Lake (4267m / 14000 ft.) via Chang-la Mountain Pass (18,000 ft/5,475 m). 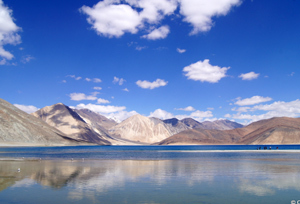 Mesmerizing vistas with the changing hues of the waters of the lovely Pangong lake. You go up to the shore of Pangong Lake till Lukung Village. Drive back to reach Leh by evening. Overnight stay at hotel. Pangong Lake, is 6 kms (4.5 miles) at its widest point, and over 130 kms (80 miles) long, and is divided by the international border between India and China. Pangong Tso presents a spectacular view of the mountains, their reflections shimmering in the ever-changing blues and greens of the lake’s brackish waters. You get to see marmots on the way and the Kiang if lucky. In the morning after breakfast checkout from the hotel, and drive towards Nubra Valley via Khardung la (Highest Motorable road in the World, 18,380 ft). Arrive at Diskit by Afternoon. Rest of the day is free to explore Diskit, Hunder Villages and camel Safari in Sand Dunes between Diskit and Hunder Village. Overnight at hotel. In the morning after breakfast have your camel safari and visit Diskit Gompa (now a major branch of Thiksey Gompa), later drive towards Leh. Overnight at hotel. In the morning drive to Kargil via Lamayuru & Alchi. Visit the Tete Spring and other interesting places like Suru Valley. Lying nestled along the northeastern foothills of the Great Himalayan wall, it extends from Kargil town, first south ward for a length of about 45 miles and then eastward for another stretch of nearly 50 miles up to the foot of the Penzila watershed where the Suru River rises. On arrival at Kargil check-in at hotel. Overnight stay at hotel. 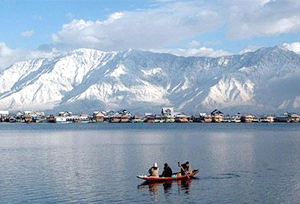 Drive to Srinagar via Drass, which is noted for its heavy snowfalls and extreme cold. On the road to Srinagar, Drass, is a small township lying in the centre of a valley of the same name. It is the second coldest inhabited place in the world. During the spring and summer, however the valley around the township becomes very picturesque. From there drive through Sonmarg, the gold valley, to Srinagar. On arrival at Srinagar check-in at Houseboat. Overnight stay at Houseboat. After breakfast excursion to Gulmarg, it is also famous for world longest cable car. This distance of 60 kms will covered in approx 2 hrs. Gulmarg has one of the best Ski slopes in the world and highest golf course of the world with 18 holes. One can also have the view of Nanga Parbat if weather permits. The view enroute from Tangmarg to Gulmarg is fascinating. One can also have a short trek up to Khilanmarg which can be covered in about 3 to 4 hrs or enjoy the scenic view of Kongdori on a Cable Car Known as (Gondola). Later visit a local Handicrafts Emporium for hand-knotted specialty silken carpets, shawls, jewelry ornaments. Later drive back to Srinagar. Overnight stay at Houseboat. After breakfast you will be transferred to airport to take a flight to Delhi. Meet on arrival at Delhi Airport and transfer to the hotel. Overnight stay at hotel. Morning after breakfast full day sightseeing tour of Old & New Delhi. Visit Including Jama Masjid, Raj Ghat, India Gate, President house, Humayun's tomb, Qutub Minar. Late in the evening transfer to the international airport to board the flight for onward destination.